LSTA funds support and advance a variety of projects. The Institute of Museum and Library Services (IMLS) supports libraries in Nevada through the Library Services and Technology Act (LSTA), administered by the Nevada State Library, Archives & Public Records. LSTA funds are intended to help libraries develop their central roles in the community and are used to promote improvements in services to the users of all types of libraries. 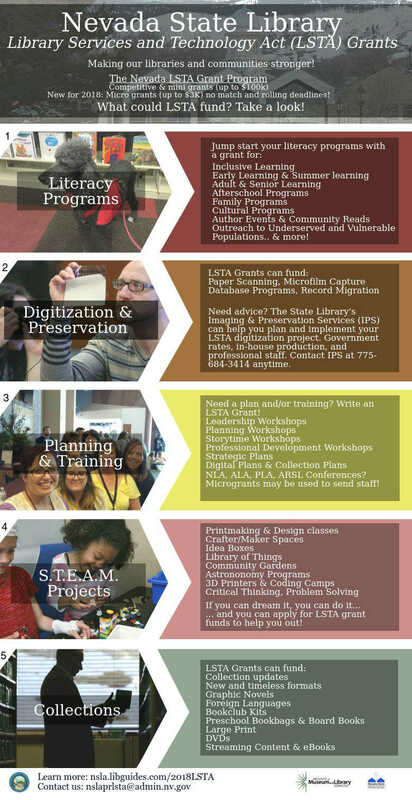 In addition, LSTA funds are targeted for statewide library services and support of a wide array of library programs. LSTA Grant cycles run from July 1-June 30. Click the links to learn more, apply for, or manage an LSTA grant.